Self-employment, others called it a freelance job, refers to the status where one individual runs his or her own business and therefore, he or she is the employer. And since it also a kind of business, then he or she should also get paid. That is the time where the self-employed invoice is necessary. Yes, even if you are self-employed you still have to issue a kind of sample receipt where it states that you should get paid, how you will get paid, and what is the amount of your payment. Not only does it guarantee you to receive your payment as a self-employed, it also shows your professionalism in business. 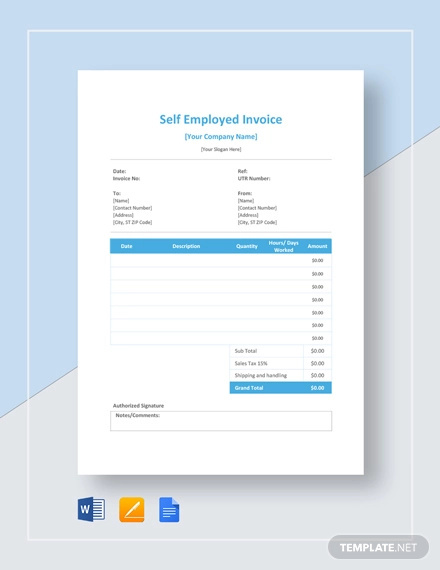 Here are the steps in creating a simple invoice for self-employed. Create an invoice template and invoice number. The first step is to create an invoice template where you can use it for every transaction. Use a proper software in creating the template, such as the Invoice Microsoft Word and Microsoft Excel. Include the following in your template. Write your service description. All the information above could be a default information in the printable invoice. However, your service description should vary and adjusted to ensure the invoices are tailored to the service you provide the client. Provide the payment details. Since one of the main purposes of the invoice is to make payments, therefore this part of the invoice should be written clearly. Include all the information regarding the payment, such as the payment methods used and how you charge your service. National Insurance and VAT. Not all invoice has this section, but every self-employed invoice should include the national insurance number and VAT information. State the terms of payment. The terms of payment invoice refer to the period of time in which the invoice should be made. Also written here is the condition if the invoice is not paid. If you are self-employed or freelance invoice, this questions always comes to your mind. And if you do not know the answer then you might be having a hard time in deciding on which day of the month you should be paid. Every time you work out the contract for each client, that is also the time you also discuss how you get paid. The best thing to do is to list out the terms of how often you plan to invoice the client and terms on how you will get paid. Standard invoice. Issued by a seller of products or services to a buyer and shows the amount of the buyer owes the supplier. Credit invoice. Commonly known as the credit memo, is issued by the seller to a buyer and shows the amount of the seller owes the buyer. Debit invoice. Also called as the debit memo, is issued by a seller to a buyer. This invoice specifically shows the increase in the amount of debt the buyer owes the seller. Prepayment invoice. This is used to record the down payment made by a buyer. Withholding tax invoice. This serves as a record every time you remit withholding tax invoice to the tax authority.